I’m on my way to Minneapolis for the rest of the week. For those of you who don’t know, I was actually born and raised in Minnesota. I went to college and started my first job there. It wasn’t until 2014 that I decided to move to Chicago. Funny enough, Abra just so happens to be from Minnesota too (we didn’t know each other before she worked for AK though!). I’m super excited to continue to work on the new Ambitious Kitchen and Ambitious Home websites + also check out some fitness studios and new restaurants in MN while I’m there. Any recommendations?! Leave a comment below and let me know your favs. ENOUGH CHATTER about me. It’s cookie time! Raise your hand if carrot cake if your favorite cake of all time, or as I like to call it the Oprah of cakes. You know, classy and sophisticated, but also something everyone can love. 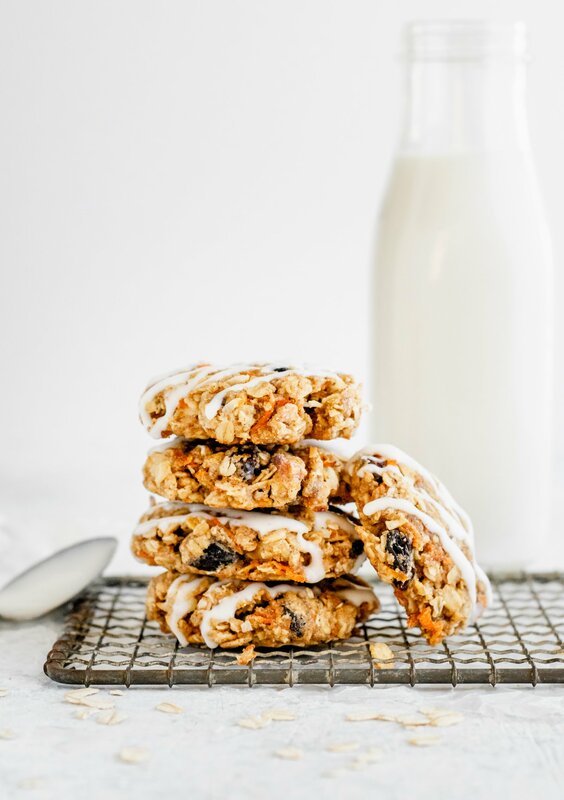 These chewy carrot cake cookies were first made by yours truly back in 2014 aka the year I became obsessed with turning my favorite cakes and breads into healthy little bite-sized cookie versions. and now healthy carrot cake cookies! As you can see, ya’ll aren’t the only ones with a real carrot cake obsession. 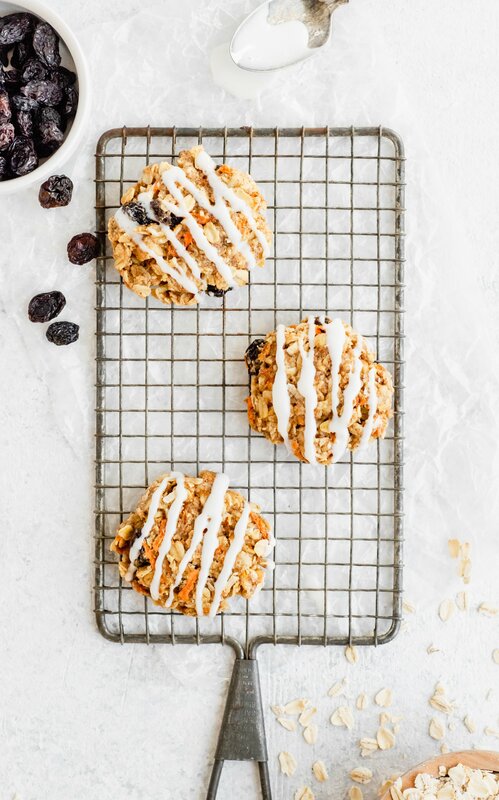 One of the reasons I love these beautiful cookies is because they’re packed with nutritious ingredients: oats, pecans, coconut and raisins then topped with a light cinnamon glaze. Together they combine in a cookie that tastes just like a slice of carrot cake. And dare I say that you could even enjoy them for breakfast?! YES YOU CAN. 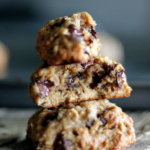 Yep, that’s right these cookies are made with whole wheat flour and oatmeal as the base. 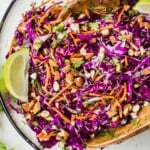 They’re also low in fat, butter-free, dairy-free, and pack a pretty great nutritional punch. I suspect you could even make them vegan by subbing in half of a banana or using a flax egg for the egg. Go crazy, kids! I actually made these cookies three different times before deciding on this version. I tried one with brown butter, another with maple syrup instead of brown sugar and the last with more oats and a cream cheese glaze. I actually really loved all of the versions (especially the browned butter one!). However, I wanted these to be a great cookie nutrition wise, be dairy free and also super tasty. In the notes below the actual recipe below, you’ll see all of my tips for substitutions. These cookies get crisp on the bottoms and outside but are deliciously soft and chewy in the middle. Secretly wishing I had chipmunk cheeks for optimal carrot cake cookie storage. For some reason, I haven’t been in a crazy baking mood lately like I usually am. But I’ll be back in the kitchen next week whipping up fabulous recipes for you. I’ve been keeping a list on my iPhone and it’s stacked with IDEAS. As always, let me know what you want to see for summer! 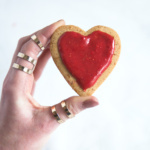 Until then, bake these cookies and tag your photos #ambitiouskitchen on Instagram! To keep up to date with posts and behind the scenes info on Ambitious Kitchen, please follow me on Facebook, Twitter, Instagram and Pinterest. 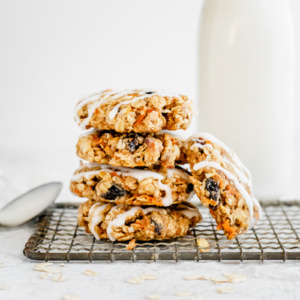 Delicious wholesome healthy carrot cake cookies bursting with coconut, raisins and pecans. Tastes just like carrot cake! In a medium bowl, whisk together flour, baking soda, cinnamon, nutmeg, and salt. In a separate large bowl mix together coconut oil, brown sugar, egg and vanilla until well combined; next fold in shredded carrots. Add in flour mixture and mix with a wooden spoon until just combined. Fold in oats, coconut, pecans, and raisins. Use a small cookie scoop and drop by tablespoonful on prepared baking sheet. Gently flatten with your hand. Bake for 9-11 minutes or until golden brown around the edges. Cool cookies for a few minutes on the baking sheet before transferring to a wire rack to finish cooling. To make the glaze: Combine powdered sugar, almond milk and cinnamon in a bowl. Drizzle a tiny bit over cookies, then let dry. Makes about 18 cookies. Feel free to leave out the raisins, pecans or coconut if you do not prefer them. You can also substitute any nut or dried fruit. TO MAKE VEGAN: Replace egg with half a large banana or a flax egg. TO MAKE GLUTEN FREE: I recommend an all purpose GF flour for the whole wheat. You can also try chickpea flour. You can also use 1/4 cup of melted butter instead of coconut oil if you aren't dairy free and prefer to bake with butter. Feel free to sub brown sugar with coconut sugar or with maple syrup. Note that if you use maple syrup your cookies will be more cake-like. If you like cream cheese (and aren't DF), try adding a heaping tablespoon of softened cream cheese to the glaze before you mix it up; it makes the glaze super creamy and delicious! Greek Chickpea Chicken Salad AK Mother’s Day Gift Guide + a Mother’s Day Insta Template! 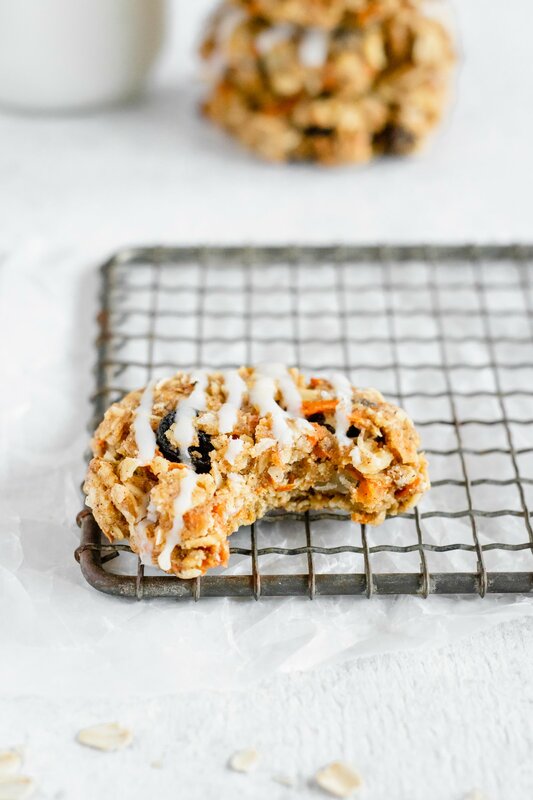 57 Responses to "Healthy Carrot Cake Cookies (made with coconut oil + dairy free!)" I am allll in on this one, carrot cake in bite size form? Yes please! These will definitely do in the meantime! Yum! I pretty much pin everything you post! These look delicious! WOWOWOW I want these. all of them. right now! Ahh! These cookies look phenomenal. I need several right now, I think. Pinning! YUM! Anything carrot cake is my favorite! These cookies sound amazing!! I love that delicious glaze on top! #nomnomnom Pinned! Can’t wait for the new blog series! Good luck in the transition! These look yummy, love the glaze! These look great, I love how you can really see the ingredients in these cookies! 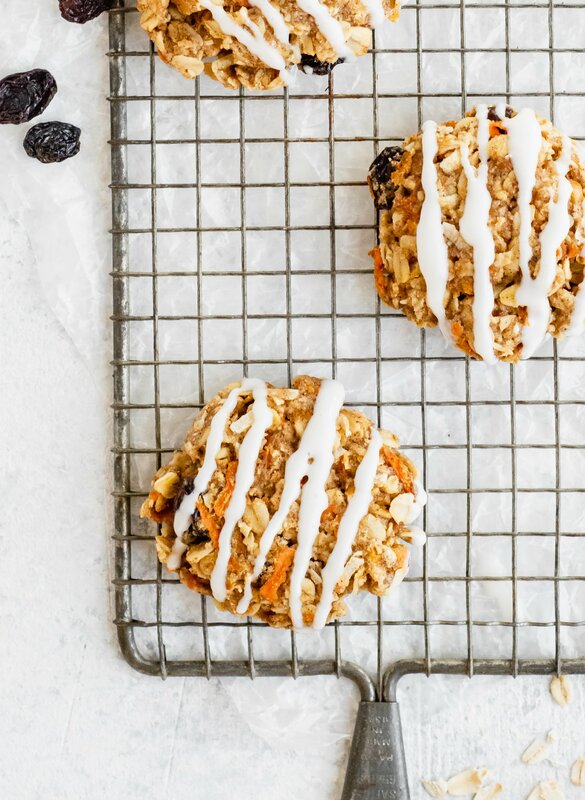 I love the idea of making carrot cake versions of cookies! Looks delicious! Hi Monique! I love your blog. I constantly check it for new recipes! Quick question, are these cookies freezer friendly? I want to make sure I don’t waste any, but I also don’t want the freezer to mess up the texture. Thanks! Oh no so sorry to hear that Yamel! Did you measure the proper amount of baking soda? Hi Monique, I’m planing on leaving the raisins, coconut flakes and pecans out and adding dark chocolate chips instead. Do you think it will work? They seam so healthy and I love dark chocolate. 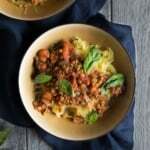 My favourite recipe from your site, I do it often. These are delicious, yummy! Carrot cake is my dad’s fave- I think I just found a new Father’s Day recipe to try for him! Yum! Just finished baking them, my kitchen smells yummy and the cookies are moist and delicious. These look great! 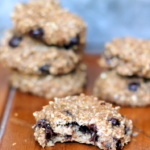 What would you suggest doing to add more protein to make it into more of a ‘breakfast cookie’? Maybe peanut butter? Hi! 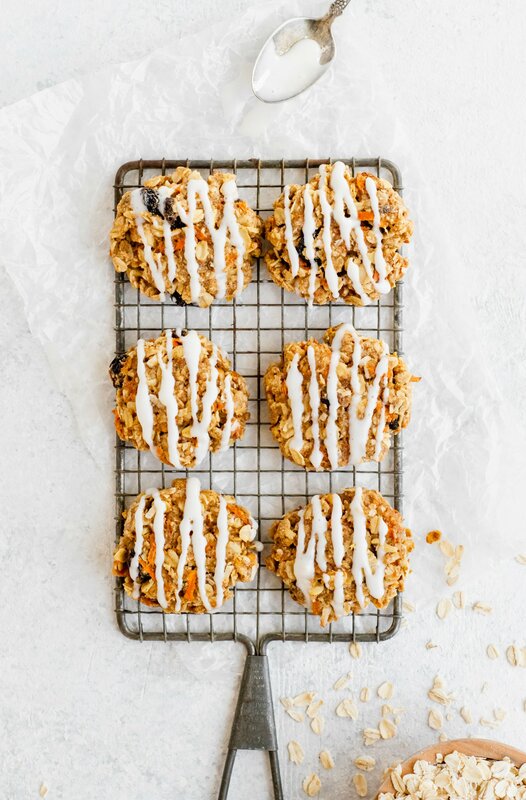 ironically I posted a recipe for protein carrot cake breakfast cookies on my blog today! I added in some protein powder. They are DELICIOUS. Making desserts/snacks that taste like carrot cake are always one of my favorites!! SO yummy!!!! Kelli, ironically I posted a recipe for protein carrot cake breakfast cookies on my blog today! I added in some protein powder. They are DELICIOUS. Going to have to try these. Definitely coconut oil and coconut sugar. Can I substitute coconut flour. But put more liquid in? Or maybe take out some of the sugar and add the flour. Hi! I was wondering if I could sub olive oil or sunflower oil for the coconut oil? I made these for my mom on mother’s day, and she loved them! They smelled so good, I may have eaten one before I wrapped them up for her! 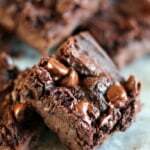 Hi, just wondering what the consistency of the batter is like. Sometimes if I use a gluten free flour blend, I have to use additional flour. I really want them to turn out with the flour I use. They look so great. Thanks! I would love to try these out! Can I use quick 1 minute oats for this recipe or does it have to be old fashioned? Also, can I substitute the coconut oil with either olive or canola oil? Yes you can use quick oats. And yes you can use olive oil or even butter. 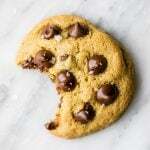 Love this cookie! I left off the glaze and used a flax egg and they came out amazing! These were so good! I will say after one day stored in an airtight container the carrots turned green! Which tells me the baking soda ratio may be too high.. Interesting! I’ve never had that happen to me before, but will definitely look out for it. Glad you liked them! These cookies sound delicious! I love and make a lot of your recipes Monique! Do you think pineapple can be added? If so how much!